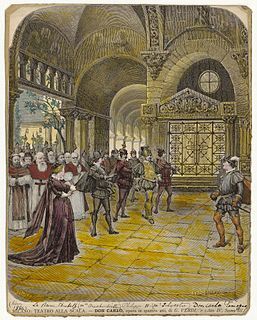 Giovanna d'Arco (Joan of Arc) is an operatic dramma lirico with a prologue and three acts by Giuseppe Verdi set to an Italian libretto by Temistocle Solera, who had prepared the libretti for Nabucco and I Lombardi . It is Verdi's seventh opera. The work partly reflects the story of Joan of Arc and appears to be loosely based on the play Die Jungfrau von Orleans by Friedrich von Schiller. Verdi wrote the music during the autumn and winter of 1844/45 and the opera had its first performance at Teatro alla Scala in Milan on 15 February 1845. 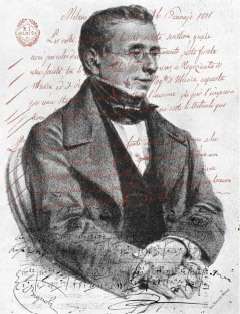 Nicola Vaccai was an Italian composer, particularly of operas, and a singing teacher. Lesbos is an island located in the northeastern Aegean Sea. It has an area of 1,633 km2 (631 sq mi) with 320 kilometres of coastline, making it the third largest island in Greece. It is separated from Turkey by the narrow Mytilini Strait and in late Palaeolithic/Mesolithic times was joined to the Anatolian mainland before the end of the last glacial period. For the next 20 years Giovanna d'Arco had steady success in Italy, with stagings in Florence, Lucca, and Senigallia in 1845, Turin and Venice in 1846, Mantua in 1848, and Milan in 1851, 1858, and 1865. It was also presented elsewhere in Europe,  Over the course of the nineteenth century, stagings declined to a very few. Charles (the not-yet-crowned King of France) describes to his officers and the villagers his vision of the Virgin Mary commanding him to surrender to the invading English army and laying down his weapons at the foot of a giant oak tree. (Aria: Sotto una quercia parvemi – "Beneath an oak she appeared to me"). Later, he expresses his frustration with the limitations of being a ruler. (Aria: Pondo è letal, martirio – "A deadly burden, a torment"). By a giant oak tree, Giacomo prays for the safety of his daughter Giovanna, who before she falls asleep by a nearby shrine offers prayers to be chosen to lead the French forces. (Aria: Sempre all'alba ed alla sera – "always at dawn and in the evening"). Suddenly, Charles arrives, prepared to lay down his arms at the base of the tree. Meanwhile, the sleeping Giovanna has visions in which angels ask her to become a soldier and lead France to victory (Tu sei bella, the Demons' Waltz). She cries out that she is ready to do so. Charles overhears her and thrills at her courage. Her father Giacomo weeps, believing that his daughter has given her soul to the Devil out of her devotion to the future King. Commander Talbot of the English army tries to convince his discouraged soldiers that their imminent surrender to the French is not due to forces of evil. Giacomo arrives and offers up his daughter, believing her to be under the influence of the Devil: Franco son io ("I am French, but in my heart…") and So che per via dei triboli ("I know that original sin"). Preparations are under way for Charles' coronation. Giovanna longs for her simple life back home. (Aria: O fatidica foresta – "O prophetic forest"). Charles confesses his love for Giovanna. She withdraws despite her feelings toward the King, because her voices have warned her against earthly love. Charles is taken to the Cathedral at Reims for his coronation. The villagers of Reims have gathered in the Cathedral square to celebrate Giovanna's victory over the English army. The French soldiers lead Charles into the Cathedral. Giacomo has decided he must repudiate his daughter who, he believes, has entered a pact with the Devil. (Aria: Speme al vecchio era una figlia – "An old man's hope was a daughter"). He denounces her to the villagers (Aria: Comparire il ciel m'ha stretto – "Heaven has forced me to appear") and they are persuaded, although the King refuses to listen. Charles pleads with Giovanna to defend herself, but she refuses. Giovanna has been captured by the English army and is awaiting her death at the stake. She has visions of battlefield victories and begs God to stand by her, explaining how she has shown her obedience by forsaking her worldly love for the King as the voices had commanded. Giacomo overhears her pleas and recognizes his error. He loosens his daughter's bonds and she escapes. She rushes to the battlefield to turn French defeat into victory once more. Giacomo pleads with the King, first for punishment and then for forgiveness, which Charles grants. Charles learns of the French victory on the battlefield but also of Giovanna's death. (Aria: Quale al più fido amico – "Which of my truest friends"). As her body is carried in, Giovanna suddenly revives. Giacomo reclaims his daughter, and the King professes his love. The angels sing of salvation and victory, as Giovanna dies and ascends into heaven. Giovanna d'Arco is scored for piccolo (briefly doubling second flute), flute, two oboes (second doubling cor anglais), two clarinets, two bassoons, four horns, two trumpets, six or nine offstage trumpets, three trombones, cimbasso, timpani, snare drum, bass drum and cymbals (cassa), cymbals (piatti), triangle, bell, cannon, wind band, wind band of brass instruments only, offstage band, bass drum for band, harp, harmonium, strings. Several recordings of live performances of Giovanna d'Arco have been released. The only studio recording dates from 1972 and features James Levine conducting with Montserrat Caballé, Plácido Domingo, and Sherrill Milnes. Domingo sang the tenor role of Carlo on that recording and the baritone role of Giacomo in a live performance recorded in 2013 with Anna Netrebko. Teatro Comunale di Bologna Orchestra and Chorus. ↑ Budden, p. 205 ff. 1 2 3 4 David Kimball (2001), in Holden, p. 983. 1 2 3 George Martin, "Verdi Onstage in the United States: Giovanna d'Arco", The Opera Quarterly, 21 (2):242, 2005 (by subscription only). ↑ Prag, R., "Giovanna d'Arco. Giuseppe Verdi", The Opera Quarterly, 14 (2): 164, 1997. ↑ Weaver, p. 123 ff. ↑ Performances in Italy [ permanent dead link ] on librettodopera.it. Retrieved 19 June 2013. ↑ Schoenberg, Harold C. (2 March 1966). "'Giovanna d'Arco,' Verdi Without a Spark". New York Times. Retrieved 5 April 2018. ↑ Chicago Opera Theater website: "Archived copy". Archived from the original on 28 March 2013. Retrieved 8 April 2013. CS1 maint: Archived copy as title (link) Retrieved 8 April 2013. ↑ Maddocks, Fiona (13 December 2015). "Giovanna d'Arco review – a first night to remember at La Scala". The Observer. Retrieved 26 March 2018. ↑ List of singers taken from Budden, p. 204. ↑ Mila, p. 163, in Baldini, p. 98. Baldini, Gabriele (trans. Roger Parker), The Story of Giuseppe Verdi: Oberto to Un Ballo in Maschera. Cambridge et al. : Cambridge University Press, 1980. ISBN 0-521-29712-5. Budden, Julian, The Operas of Verdi, Volume 1: From Oberto to Rigoletto. London: Cassell, 1984. ISBN 0-304-31058-1. Kimbell, David (2001), in Holden, Amanda (Ed. ), The New Penguin Opera Guide. New York: Penguin Putnam, 2001. ISBN 0-14-029312-4. Kimbell, David (1981), Verdi in the Age of Italian Romanticism. Cambridge et al. : Cambridge University Press, 1981. ISBN 0-521-31678-2, ISBN 978-0-521-31678-1. Osborne, Charles, Verdi: A Life in the Theatre. New York: Alfred A. Knopf, 1987. Parker, Roger, "Giovanna d'Arco" in Stanley Sadie, (Ed. ), The New Grove Dictionary of Opera, Volume 2. London: Macmillan Publishers, 1998. ISBN 0-333-73432-7, ISBN 1-56159-228-5. Warrack, John and West, Ewan, The Oxford Dictionary of Opera. New York: OUP, 1992. ISBN 0-19-869164-5. Weaver, William, The Golden Century of Italian Opera from Rossini to Puccini. New York: Thames and Hudson, 1980. ISBN 0-500-27501-7. ISBN 978-0-500-27501-6. De Van, Gilles (trans. Gilda Roberts), Verdi’s Theater: Creating Drama Through Music. Chicago & London: University of Chicago Press, 1998. ISBN 0-226-14369-4 (hardback), ISBN 0-226-14370-8. Gossett, Philip, Divas and Scholar: Performing Italian Opera, Chicago: University of Chicago Press, 2006. ISBN 0-226-30482-5. Martin, George, Verdi: His Music, Life and Times. New York: Dodd, Mead and Company, 1983. ISBN 0-396-08196-7. Osborne, Charles, The Complete Opera of Verdi. New York: Da Capo Press, 1969. ISBN 0-306-80072-1. Parker, Roger, The New Grove Guide to Verdi and His Operas. Oxford & New York: Oxford University Press, 2007. ISBN 978-0-19-531314-7. Pistone, Danièle, Nineteenth-Century Italian Opera: From Rossini to Puccini. Portland, OR: Amadeus Press, 1995. ISBN 0-931340-82-9. Phillips-Matz, Mary Jane, Verdi: A Biography. London & New York: Oxford University Press, 1993. ISBN 0-19-313204-4. Rizzuti, Alberto (ed. ), "Giovanna d'Arco: Dramma lirico in Four Acts by Temistocle Solera", in The Works of Giuseppe Verdi (critical edition), Series 1: Operas. Chicago: University Of Chicago Press, 2009. ISBN 0-226-85330-6, ISBN 978-0-226-85330-7. Toye, Francis, Giuseppe Verdi: His Life and Works. New York: Knopf, 1931. Walker, Frank, The Man Verdi. New York: Knopf, 1962. Chicago: University of Chicago Press, 1982. ISBN 0-226-87132-0. Werfel, Franz and Stefan, Paul, Verdi: The Man and His Letters. New York: Vienna House, 1973. ISBN 0-8443-0088-8.